Spanish moss, dangling from the branches of the live oaks, reflected in the murky waters of the bayou as my swamp boat drifted silently forward. According to legend, the strands are the beard of the brute Gorez Goz, tangled in the tree's branches as he climbed after a young Indian girl he'd purchased for a yard of braid and a bar of soap. The maiden, thankfully, escaped the embraces of her pursuer, but Spanish moss still decorates the bayou like grayish-green tinsel. By night the moss brings an eerie atmosphere to the bayou -- in voodoo it's used in the Success Ritual, mixed with Frankincense tears, a candle, and a few other things, and burned to engulf your desires and carry your prayers to the spirits that be. And if spirits do live in the world, surely they dwell in the Louisiana bayous or sleeping waters. I find Louisiana a fascinating place, from the Spanish moss to the plantation homes of bygone eras. But what I love most about Louisiana is the bayou: the waterways wending across the land, birds hooting and cawing at the swamp's intruders, the sun straining through the overhead canopy of lush green tropical growth, and the alligators, creatures that time forgot. Captain Garry, my guide on the Cajun Critters Swamp Tour had dozens of stories to tell about the waterways that are home to hundreds of birds and animals. With over a 100 species of snakes alone, including the cottonmouth and two other poisonous ones, the bayou is an environment to be respected. My keenest interest however — and one of the most dangerous inhabitants of the bayou — was the alligator. I traveled along the waterways of Bayou Segnette, near Westwego, hunting these creatures with my camera. The Bayou Segnette State Park contains both marsh and swamp wetlands, with the creation of new canals changing swamp area to marsh. Bald eagles and red-tailed hawks soared overhead, along with Mississippi kites, red-winged blackbirds and cardinals whose songs carried through the trees. Where there wasn't water there were trees. While the live oaks will always be my favorite, I found the red maples, willows and tupelo tree all beautiful as well. Captain Garry advised us it was safe to eat mushrooms from the willow, but a felony to pick them from cow manure as they were likely hallucinogenic. Luckily, I was looking for alligators, not mushrooms. Alligators have lived since the time of the dinosaur, or nearly two hundred million years, with virtually no evolutionary changes. They are members of the crocodile family, and can be distinguished from it by head shape and color, as well as teeth — not that I wanted to get too terribly close to its teeth! The alligator, unlike the crocodile, lives in more moderate climates, simply going into a state of inactivity or dormancy when the temperature falls below about 68 degrees. The alligator eats anything from armadillos to snakes, which make it a predator at the top of the food chain in the swamp. An aged male alligator may grow as long as 14 or more feet, and weigh up to 1000 pounds, so that it is a veritable tank in the water with its all-over body scales joined by skin for flexibility. A breeze off the water kept me from getting too hot while leaning out over the railing of our swamp boat. I didn't want to miss a single moment of my adventure as we progressed slowly down the waterway. Every so often Captain Garry inched us closer to shore to where he knew there were "gator holes" where we might see one coming up to sun himself. At last my patience paid off. 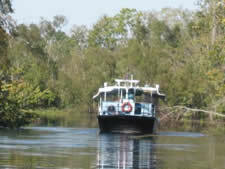 The boat drifted through a quiet little bend, with the sunshine pouring onto the trees. An alligator, eyes and nose protruding from the water, drifted along, almost looking like a chunk of log or tree root himself. The goose bumps that rose up on my arm had nothing to do with the temperature — it was a thrill to see the king of the bayou. I watched him glide through the water, then heard the splash as he climbed onto the shore to stretch out and soak up the sun's rays. From the swamp tour by boat I moved on to a swamp walking tour in the Jean Lafitte National Historical Park and Preserve near the town of Jean Lafitte. Walking through the vegetation, the swamp was even more amazing, and Chief Ranger Jim Carson answered my many questions with ease. My hike began on a large natural levee (dirt wall or barrier to contain the water) on the Coquille Trail. Beginning slightly above sea level, the growth consisted of mostly hardwoods. Heavy with foliage these trees reached for the sun, and were home to twittering birds and animals, like the squirrels. As the elevation dropped the vegetation changed to palmettos. I half expected a pterodactyl to fly overhead, or a Stegosaurus to emerge from the lush overgrown ferns and plants. I stopped to examine a midden-and ask Jim about it. The midden was a mound made up of shells, bones, pottery and other refuge left by Native Americans a thousand years earlier. The mounds traditionally rose as high as 20 or 30 feet and covered an acre or more. However, over time the middens were mined for shells to use as roadfill and to make lime and concrete, so this one was not in its original state. Finally I came to the most dramatic part of the swamp: the flooded forest. 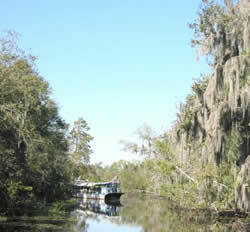 With its canopy of bald cypress and water tupelo it created a mood of intrigue and mystery. The bald cypress is the monarch of the swamp, growing as high as 100 feet and up to 15 feet in diameter over hundreds of years. One enormous example still remained, left by loggers, to show the grandeur of the original last primeval swamps of Barataria. The knees of the bald cypress, or pieces of thick root sticking out of the ground, help stop the flow of water and catch soil in the swamp, making them an important part of the ecosystem. The mosses, vines, air and water plants, along with fungi, lichens, algae and ferns envelop the flooded forest, so it seems that every inch of it is alive and growing. Even the small ponds are completely covered with tiny floating plants. A nutria (the swamp's version of a giant rat) darts between between the trees, anxious to avoid becoming lunch for larger predators rustling through the undergrowth. My visit to the bayous of Lousiana was an adventure I'll never forget — and one I'm anxious to repeat.